Summary: Georgia knows what it means to keep secrets. She knows how to ignore things. She knows that some things are better left unsaid. . . . Or are they? I know this is going to sound strange, but I've been procrastinating reading THE HEART IS NOT A SIZE by Beth Kephart. You see... I absolutely love Beth and I even consider her a friend. I think she is a marvelous author and I've loved the other books that I've read by her. So I admit that I was a little nervous when I picked up THE HEART IS NOT A SIZE. What if I didn't love it? I had no need to worry because Beth does not disappoint with THE HEART IS NOT A SIZE -- I absolutely adored this book. I found that when I was reading this novel, I treasured each and every word. 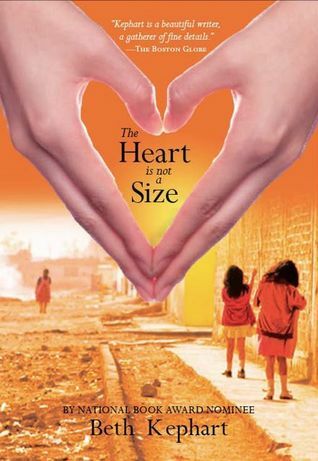 THE HEART IS NOT A SIZE isn't a long book, and yet, it delivers a beautiful story with a very powerful message. I really get the impression from this novel (and really every Beth Kephart novel) that she chooses each word for a specific reason and to elicit a particular feeling in the reader. She is an amazing storyteller!
" You grow up being told that responsibility is a good word, that you should step forward first, that you should manage; but the truth is: Too much responsibility gets you into trouble. It boxes you in, divides you into two very different, separate people. Your responsible, sold version is what everybody comments on: Georgia's reliable. Georgia will do it. Georgia always knows what she is doing. She will come through. Your private, hidden self, meanwhile, would shout a different story." I swear Beth could have been writing this about me. I had these exact same feelings as a teenager (and sometimes I still do!) I read a lot of books, but rarely do I experience the emotion that I did while reading THE HEART IS NOT A SIZE. And that was just as it related to the character of Georgia. The entire trip to Mexico also touched my heart. I was also deeply affected by the parts of the story about Juarez -- how could any reader not be touched by how these people live? I appreciated that Beth gave us an insider's look into a squatters village in Mexico -- she actually took a trip to Juarez and helped build a community bathroom there. I've seen pictures and news stories about the living conditions of these people, yet I think THE HEART IS NOT A SIZE brought the reality to home for me. After I finished this novel, I wanted to do something to help...something to make a difference. And I love Beth for not only helping me to have this awareness, but also for bringing this reality to the attention of today's teens. Needless to say, I think THE HEART IS NOT A SIZE is a perfect discussion book, especially for mother-daughter book clubs. There are so many important themes in this novel which would be perfect to explore deeper with a teen (or even an intuitive tween.) And many of the topics deal with some very sensitive, yet important, situations that aren't always easy to bring up with your daughters. Some of the topics which warrant further discussion include friendship, mother/daughter relationships, family dynamics, eating disorders, poverty, anxiety, insecurity, sacrifices, gratitude, and self discovery. THE HEART IS NOT A SIZE is a very special book to me. I can't wait to share it with Booking Daughter because it's exactly the type of book that I want her to read. There is a very real character in Georgia that I know she will love, but there is also a wonderful message about giving back and helping those who are less fortunate than us. A huge thanks to Ms. Kephart for sharing a copy of her novel with me. I am sorry to say that I've yet to read any of Beth's books, but I hope to read this one as part of the love fest! I feel the same way about Jacqueline Woodson...few words, huge impact. Very efficient writing! Your review is beautiful! I loved this book too! Another YA author that I am going to have to check out. I liked your review specially the part about the village in Mexico. Fantastic review, Julie! You all are making me so eager to buy and read this book. Julie, you just made me cry. Georgia, Julie, is so much of me. You, then, are the beautiful (inside and out) version of me. I've never heard of this author so thanks for bringing her to my attention. Oh, she's YA. no wonder. I don't read those really. I think you hit on part of the reason why I love Beth's books so much. Her characters are just so much ordinary kids, ordinary people, I often do relate to them better than I do to many other YA characters. What a wonderful, passionate review! I really enjoyed it too, and it was the first book of hers I read. Thanks! i have heard so many great things about this book and definitely have this on my wishlist. What a great review! Can't wait to read this book. It sounds like a great one. I haven't read any of her books yet. I'll have to come back to read this review -- I plan to read this one next week. Sounds like another good read from Beth. I really loved Nothing But Ghosts...I'll have to put this on the to-read list as well.